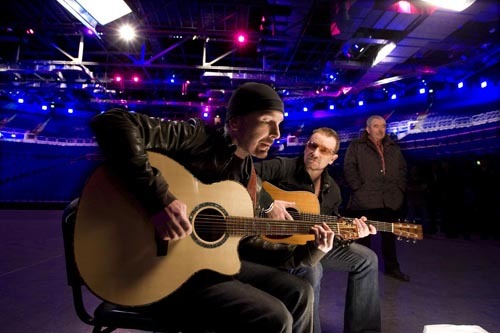 Edge and Bono dropped in on Dublin's soon-to-be-opened O2 arena at the weekend, performing a couple of numbers from Rattle and Hum ... just as the band did in the same place more than twenty years ago. They were there to take part in a special RTE programme about the late Ronnie Drew, to be screened over the holiday period - and were also interviewed for John Kelly's The View, a programme that will go out on Tuesday December 16th on RTE One. The performance had a certain synchronicity about it. It was twenty one years ago that Harry Crosbie set up camp in the derelict old railway goods yard on Dublin's deserted docks to begin work on what became The Point Depot - one of the city's great venues of recent times. The first phone call Crosbie got, surrounded by trains and freight, was from U2's office. The band booked the venue for the filming of Rattle and Hum. 'It was still in its original condition as a railway depot', remembers Edge. 'But it was absolutely amazing looking and we said, wow - this is exactly the kind of place we want, something really about Dublin City and where we came from'. U2 also famously rang in the New Year in 1990 in The Point Depot in a series of concerts during the Lovetown Tour. Harry asked Bono to play it again for the O2, the brand new development built on the site of The Point. You can see their performance of 'Van Diemen's Land', the first in the new O2 Arena - along with the interview - on The View next Tuesday. More on the RTE tribute to Ronnie Drew as we get it.